Programming cables (programmers) for most types of radios are based on the same principles. Programmers perform voltage conversion between RS-232 levels and radio specific levels. Usually radio FPUs have CMOS input and output levels shifted by protection elements. Progamming circuits for several radio types are shown on Fig.1. Fig. 1a - mobile KENWOODs TK-760/860(G), Fig. 1b - portable KENWOODs (TK-378), Fig. 1c - portable VERTEX VX-10, Fig. 1d - portable YAESU FT-11R/41R, Fig. 1e - mobile MOTOROLA GM-300, Fig. 1f - mobile VERTEX FTL-1011/7011, Fig. 1g - some mobile ICOM radios. Fig. 1h shows how the programmer interacts with the radio programming input/output. A thorough analysis of radios programming cirquits leads to the following programmer schematics. Usage of Schmitt trigger (VT3, VT4) with high logic zero threshold (V-=1.7V) is essential if the input and output buses are linked together. This is due to the voltage divider Rk/R1 (see Fig. 1h) which shifts up the logic zero volage. VT1, VT3, VT4 transistors may be BC847 or similar (i.e. BC547B, etc. ), VT2 may be BC857 or similar (i.e. BC557B, etc.). Fast silicon diodes of any type will do, for example 1N4148 or LL4148 in MiniMELF case. LP2950 is replacible with 78L05, but it is the worst choice due to IC's high current consumption. It may fail to work in some cases. Use 78L05 with an external power source only. Cables for RRxD and RTxD connections should be shielded. Multiwire cable with low mutual capacitance among wires is also applicable. Otherwise TxD to RxD interference may result in programming failure. It is important for some KENWOOD radios. It is convenient to use an additional connector for attaching particular radio jacks to the programming cable. DB9 is recommended as a highly reliable connector. Cable connection to KENWOOD portable radios has a specific feature. Radio sockets have prominent rubber rings, thus standard stereo jacks cannot be plugged in firmly. The jack flanges should be ground off till 5 mm in diameter. The jack cases should be cut accordingly. TK-353 radios are put in the program mode by holding the side button below PTT and C button while powring the radio on. " --PC--" should appear on its display. TK-250 enters programming mode by pressing Lamp and Lo buttons while turning the radio on. 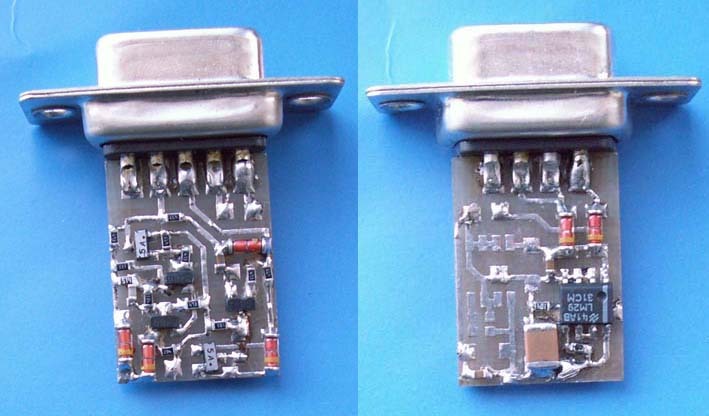 An unusual connector is needed for KENWOOD TK-690/790/890 radios. Common data transmission and reception line is used. The cable can be used as a CAT interface for tranceiver control. This cable connector includes separate Tx and Rx data lines and a power supply from the radio. In MOTOROLA GP300 connector use 2 Ampere diode if you intend to transmit with the cable connected or 1 Ampere diode otherwise. In MOTOROLA P040-P080 connector grind off the jack flange until the jack can be seated in firmly. This connector does not need an external power supply if it is provided from the port by a programming software. In MOTOROLA GP-340 connector the output voltage is limited to approximately 3 Volts. The specific jack is used, it is shown on Fig. 4. MOTOROLA mobile CM series radios are programmed through the rear accessory connector. The programming cable is not powered from the port. The power supply can be taken from the radio power supply or the accessory connector if available. VERTEX VXR-5000 and VXR-7000 programming software works improperly on modern computers with fast processors. Computers with i80486 are recommended by VERTEX, also iCeleron 433 MHz processor may be used. A connection to devices with a non-standard processor supply voltage (cordless and cellular phones) requiers a specific connector. A TxD key power is taken from the phone, so the input logic levels cannot exceed the processor supply voltage. For example SENAO SN-258 is attached by its test connector in this way: TxD - cont. 1, RxD - cont. 2, GND - cont. 3, Vbat - cont. 5. R1 resistor may be omitted because the phone RxD cirquit has an inner 47 kOhm resistor to the ground. Alexander Nesterov has designed the TAIT T2000 series radio connector. The main idea is the additional level invertion using a CMOS logic IC. CD4093 is recommended because it has Scmitt trigger inputs. However, any CMOS invertor can be used. Unused IC inputs (not outputs !) should be grounded. Alexander Nesterov has also designed the programmer schematics enhancements (VD8 and R13) and a specific connector to program MAXON SL500 radios. The programmer is used as a non-inverting buffer. In SL500 connector VD1 and VD2 diodes provide an extra protection of radio. They can be omitted if desired. Oleg EX8MLT has proposed HYT TC-500 radios connector. It is different from KENWOOD portables connector which is used for other HYT radios. Both jacks should be plugged in simultaneously. Alexander Ivanov has designed a connector to ALTAVIA radios. These radios are designed and manufactured in Russia. The connector is similar to MOTOROLA P040/P080 portables connector but needs no external power supply. The cellular phones connector can be used for applying AT-commands or firmware reload. There are no hardware flow control cirquits in the connector. The Siemens specific connector is shown. Use it for AT-commands with the switch turned off, for firmware downloading the switch should be turned on. The Siemens phone socket pinout is taken from http://www.pinouts.ru/data/siemens_c25_s25_pinout.shtml. For more information please search specific cell phone sites. The programming cable printed cirquit board was designed by Valery UA6LPG with non-chip components. In order to print it save this GIF image to disk. Then open the GIF file with Adobe Photoshop (or any other editor) and change the image resolution to 600 dpi (look for it at Image/Image size menu). Print it, it will be of the right size. Please note that Rind resistor and a LED are used just to indicate the power supply voltage. You can omit R12, Rind and a LED, the cirquit will work. The recommended value of Rind is 4.3 kOhm to minimize the current consumption. Another PCB variant was designed by Vyacheslav UR5ROZ. Optimal PCB picture resolution is 300 dpi. This is the programming cable implemented on the 2-layer PCB and SMD components by Sergey UA0CIC. This implementation can be easily placed inside the DB9 case. The programming cable was tested with 172 device types, i.e. A35 the author (firmware programming) Freia, etc. PLEASE NOTE ! The author does not collect and does not distribute radio programming or service software. Please do not apply for the software !